Dr. Smith's ECG Blog: 15 hours of chest pain. Too late for thrombolytics, right? Unstable Angina still exists. 15 hours of chest pain. Too late for thrombolytics, right? Unstable Angina still exists. The time window for therapy with thrombolytics is up to 12 hours after the onset of chest pain, based on many studies done in the thrombolytic era. However, this data comes from studies which took no account of acuteness features on the ECG. ECGs with large upright T-waves are hyperacute, and indicate a very early MI and lots of viable myocardium. No matter how long the duration of chest pain, patients with an ECG with high acuteness [Proportionally large T-wave, large amount of ST elevation, persistence of R-waves (R-, QR-, qR-)] indicate that the MI is not subacute, but acute, and thrombolytics may be given. Subacute MI that is beyond the thrombolytic window, and consistent with a true duration of 12 hours or more, has smaller T-waves (both less tall and less bulky), often some T-wave inversion, QS-waves, ST elevation that is not very high. Subacute STEMI. Should the patient go for emergent PCI, or can he wait until the next day? A 60-something woman called 911 after 15 hours of chest pain. The pain was a 7/10 burning pain "above" her chest, non-radiating, not related to exertion, constant, and worsening all day. She called 911 because the pain was worsening. This is diagnostic of acute MI regardless of the duration of symptoms. This ECG shows high "Acuteness"
The findings are much less obvious. There must have been some reperfusion. If no PCI is available, and there are no absolute contraindications, then thrombolytics are indicated!! The patient went immediately to the cath lab and had a proximal LAD occlusion. The initial troponin I was 0.012 ng/mL (negative). In other words, this patient had unstable angina for 15 hours. Given the ED ECG and the troponin, it is obvious that the patient's artery is opening and closing enough to prevent any infarction, only (reversible) ischemia. The troponin peaked at a low peak value of 2.0 ng/mL. What if the patient had presented 13 hours previously, after only 2 hours of chest burning? Imagine if she had come to the ED with chest pain of 1 hour duration. Her 0, 2, 4, and 6 hour troponins would have all been negative. Without a positive risk stratification score, she might have been sent home. Of course we do not know what the ECG would have shown, and it very likely would have shown at least subtle signs of LAD ischemia. If her ECG had been normal, then her HEART score would have been 3, and she would be eligible for discharge after 2 negative troponins. If her ECG had been "non-ischemic," her EDACS score would have been 10, and she would be eligible for discharge after 2 negative troponins. We will never know what her ECG would have looked like after 2, 4, 6, 8, 10, or 12 hours of chest pain, but this shows that the ECG findings can be critical added information to the clinical presentation and serial negative troponins. Any suspicious ECG findings in this patient who would have had serially negative troponins would have to be acted upon with at least admission for risk stratification. As you all know, I have posted many cases of positive ECGs with negative troponins. We don't know what "high sensitivity" troponins would have shown, but I suspect that early on, in this case, they would not have been "positive." 1. Thrombolytics are indicated in STEMI even if there is prolonged duration (greater than 12 hours) if the ECG shows high acuteness. 2. High Acuteness is measured by large T-waves, large amount of ST elevation, and absence of QS-waves. 2. Unstable Angina still exists. If a patient has a low risk score and 2 negative troponins, they are still high risk if the ECG shows any signs of ischemia. There are no studies which show safety of high sensitivity troponins without use of the ECG. Diagnostic Performance of High Sensitivity Compared with Contemporary Cardiac Troponin I for the Diagnosis of Acute Myocardial Infarction. 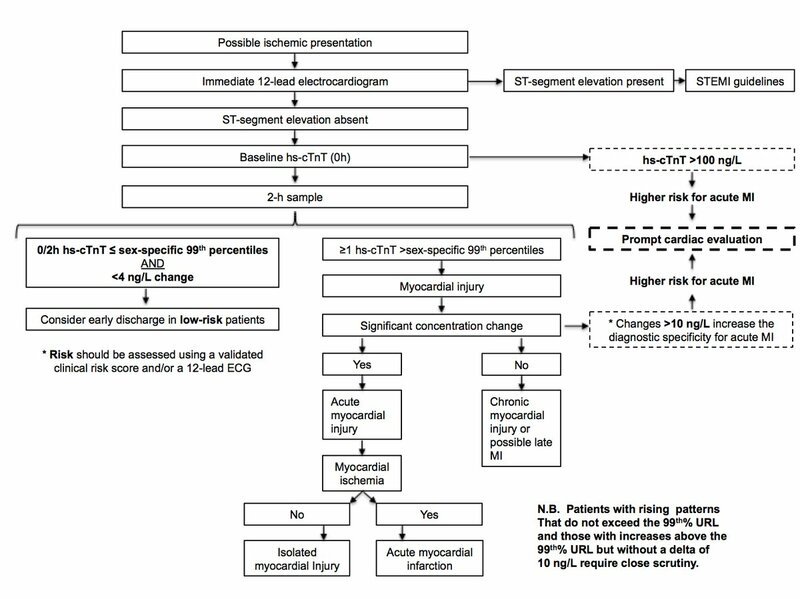 Here is a pathway just published for hs troponin T. Note that is still uses ECG and risk stratification!! Great point Stephen. I wouldn't have hesitated to send someone with that ECG to cath, regardless of time from onset. We have shown that high-sensitivity troponin does not elevate even in echo-proven myocardial ischemia on a stress test: Myocardial Ischemia on Cardiac Stress Testing Is Not Associated with Changes in Troponin T Levels. The Journal of Applied Laboratory Medicine 2017 Mar, 1 (5) 532-543; DOI: 10.1373/jalm.2016.021667 So I think your point about unstable angina is a great one. Yes, I retweeted your article too, from Alex Limkakeng. But, you're advocating thrombolytic therapy without ST elevation? - that's a tricky precedent to suggest - sure I accept that in this particular case that may have been beneficial... but in other cases is likely to be harmful. For example - just because the troponin was <ULN at 15hrs doesn't mean it would have been after 1, 3, 5 or 7 hrs of pain. I look at my case and often think the same - 'Imagine if we hadn't captured the ECG showing 5mm of ST elevation and only the one later which had normalised...' but the fact is we didn't. The fact that we do ECGs in patients with chest pain is critically important. As I answered in my tweet, I have no idea where you got the idea that I was recommending thrombolytics without ST elevation. I did not. However, they are indeed indicated when there is only ST elevation in aVR, even though it is not true ST elevation (it is reciprocal to ST depression elsewhere). This is a new recommendation of the ACC/AHA in 2013, in addition to ST depression of posterior STEMI. It's a moot point anyway if you have the cath lab, because obviously that is where the patient should go. I guess a more pertinent question is what do do if the patient is not at a hospital with a cath lab. If they were pain free I would wait another 5-10 minutes after the second ECG before subjecting them to the risk of thrombolytic. The ST elevation is only partly resolved, but is still there and still ischemic. The formula values refer to this ECG which does look much better but still indicates occlusion (or near total occlusion with suboptimal flow. Thrombolytics are indicated if there is no cath lab. My comments on aVR are right on. This is a SUPERB case with too-numerous-to-count learning points! Regarding the 1st ECG — Acuity of this tracing is obvious (as per Dr. Smith) from the hyperacute ST segment elevation. There is LOSS of r wave from V1-to-V2, V3 — with development of a deep Q wave by V4 — but the shape and dramatic amount of ST elevation indicates acuity regardless of the prolonged duration of symptoms. Note in addition (and admittedly difficult to discern given the baseline artifact) — that there IS reciprocal ST depression in lead III, with abnormal ST flattening in aVF. While the dramatic ST segment elevation changes here are obvious — there are MANY times in which patients with prolonged symptoms have more modest ST elevation — in which case it may ONLY be the reciprocal ST-T wave changes that confirm suspicion of acuity. And remember the reciprocal (nearly “mirror-image”) relationship that is nearly invariable with acute injury/infarction for ST-T wave appearance between leads III and aVL. Mentally subtracting the artifact in lead III — there clearly remains near “mirror-image” ST depression of the ST elevation in aVL. Regarding the 2nd ECG (taken 23 minutes later) — the learning points are best highlighted by imagining this 2nd ECG was the ONLY tracing available in this case. It is essential to appreciate that this is not a normal ECG. There is subtle but definite loss of r wave from V2-to-V3. The small q wave in lead V4 suggests this loss of anterior r wave is real and reflects ongoing events. In a patient with 15 hours of chest pain — there should be no doubt that the ST-T wave in both leads V2 and V3 is disproportionate (too tall, and too fat at its peak considering the small amplitude of the QRS complex in each of these leads). In the context of this ST-T wave abnormality in leads V2,V3 — the T wave in V4 is also disproportionately “too fat” at its peak. That these subtle chest lead findings are real is confirmed by again mentally subtracting the baseline artifact in the inferior leads and in lead aVL (to see subtle-but-definite ST elevation in aVL, and ST flattening, if not slight depression in the inferior leads). Taking the combination of these subtle-but-real findings that are present in at least 7 of the 12 leads, together in the context of a patient 15 hours of chest pain — is virtually diagnostic of an ongoing acute event. Bottom Line — The fact the symptoms in this case were prolonged, but that dramatic ST elevation was nevertheless still evident in ECG #1 when the patient finally presented, is strong evidence (as per Dr. Smith) that there was unstable angina for most of those initial 15 hours. The fact that these dramatic ST-T wave changes then dramatically diminish over the next 23 minutes tells us that there has to have been spontaneous reperfusion (which was probably ongoing with stuttering course for the previous 15 hours). A better example of how acute STEMIs may spontaneously reperfuse, then reocclude — then reperfuse again could not be found. Brief clinical history + these 2 serial tracings tell a powerful story. GREAT case by Dr. Smith! all great points! thanks, Ken!